Dance to good time rock 'n' roll pop music from the 50's performed by those who were there when the hits happened! Free dance lesson from Dave & Corrine Hopkins starting at 6:30pm! The Original Rocketeers is purely and simply, an oldies band. The quartet specializes in rock 'n' roll, rock-a-billy and crossover standards music between the years 1955 and 1965. From Chuck Berry to The Beatles, Elvis to Tommy James, and Bobby Vee to Jimmy Buffet, TOR has the all the danceable hits. 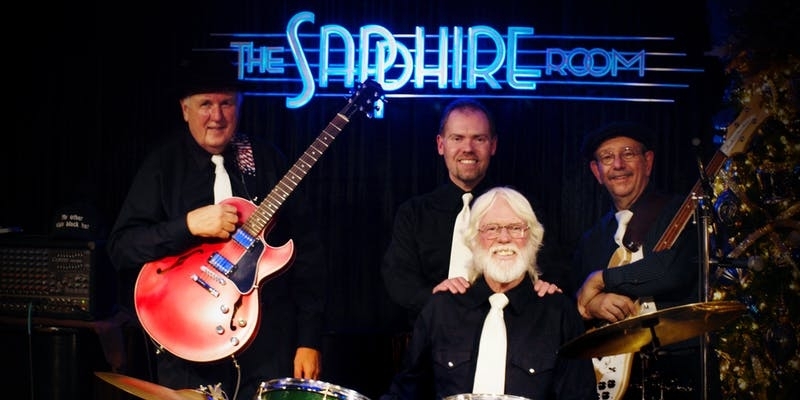 Having its genesis as an offshoot of Idaho's legendary classic rock sextet, The Fabulous Chancellors, TOR is geared for audiences who want to hear and dance to rock 'n' roll classics with its original sound and feel. All four members of The Original Rocketeers have been a band's lead singer at one time or another, and all are current members of The Fabulous Chancellors. As an aside, since TOR's inception, there have been no changes in membership, therefore they are truly “original”. An Idaho native, Ross has been a noted name in the Southern Idaho music scene for 5 decades. As the primary vocalist and lead guitarist of TOR, he leads the lineup and serves as manager for the band. As the other instrumental soloist, Jamie provides the much-needed colors available to keyboards (piano, organ, strings, marimba, etc.) and the saxophone. He is the youngest of three Boise brothers noted for musical excellence. A product of California, Randy had been both a drummer and singer/songwriter. In TOR he provides the baritone/bass voice and lays down the beat that is the backbone of rock 'n' roll. A full-time music professor at Boise State for 36 years and Cleveland native, Joe is known as a multi-instrumentalist. In TOR, he is the other half of a solid rhythm section and provides the high tenor vocals.